What's the greatest noise pollutant facing the countryside? Not planes, not yobs, it's the train horn, apparently. And amid the clamour from villagers fed up of waking to it, the rail industry is looking for a solution. The sound of a steam engine's whistle conjures up black-and-white movie images of tearful farewells. Or for the less romantic, it's a proud symbol of British engineering. But its modern equivalent is unlikely to be regarded with such nostalgia. Thousands of people across the UK have complained the horns on the new sleek, comfortable and, yes, quiet trains are just too loud. The rail industry is meeting MPs on Monday to discuss how to tackle the problem, which has been compounded by increased concerns about pedestrian safety. 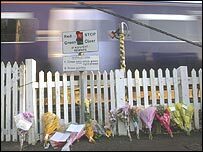 In December, two 14-year-old girls were killed by a train at a crossing in Essex. Train drivers are instructed by "whistle boards" to sound their horns 400 metres before they approach certain level crossings. The number of these boards has risen by a third in the last five years to 1,224, with another 257 to be installed this year. Sheila Kolstoe, 57, has a whistle board at the end of her garden in Lingfield, Surrey. It's one of three to torment villagers living near that stretch of track, from 5am to past midnight. "I've lived here since 1987 and it wasn't until the new trains were introduced that horns became a problem," she said. "It used to be a dull noise the body could absorb, but now it's two-tone and causes stress and sleep deprivation. "It's like a form of torture. Imagine every time you go to sleep you get woken up every 20 minutes by a noise louder than a pneumatic drill." Residents in Leicestershire have the same problem. Janet Barkby lives a quarter of a mile from a foot crossing in Barrow-on-Soar. "It's got louder, the length of the noise has got longer and it's a more piercing sound than it used to be. Safety is paramount but when you consider it's only a foot level crossing and it's not very busy, it seems a little over-the-top." 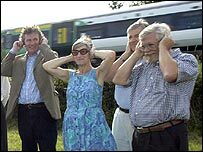 The Noise Abatement Society says it has received 17,000 complaints in the last couple of years, from right across the UK, and describes train horns as the worst noise pollution facing the country, the equivalent to standing behind a jet engine. A person one metre away would damage their hearing instantly, said Deborah Withington, a professor of auditory neuroscience at Leeds University, who has researched the impact of the new horns. "It can be as high as 130 decibels, although in people's back gardens, from a realistic distance, it's more likely to be 70 or 80 decibels. "People won't suffer definable hearing damage but there will be a huge annoyance based on sleep deprivation and their quality time being messed up. Even in between horns, people are on edge, waiting for it." 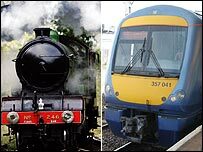 Peter Ainsworth, MP for East Surrey, has proposed a motion in Parliament, backed by 70 MPs, which calls for train companies to install the broadband horns used in the US, at a cost of £700 each, or revert to the old horns. Before heading into Monday's meeting with Network Rail, he said: "Either we move to a broadband version, which has a narrow range of fire, so to speak, is heard by far less people and directs the noise down the track to alert people in danger, or we replace the horns with quieter ones. "Everyone's used to having horns at crossings but there wasn't a problem until they replaced the trains. "The new trains are much quieter but their horns are a serious problem for thousands of people up and down the country, and it needs to be addressed urgently." Guidance on horns is issued by the Rail Standards Safety Board which revised the rules in 2003 in response to complaints. It said horns need no longer be used going in and out of tunnels, and lowered the minimum decibel level from 120 to 112. Spokeswoman Diana Lucas said in cases where there was clear visibility on a straight railway track, there may be no need for a horn, but it was up to Network Rail to assess the risk at each crossing and decide what form the warnings would take. Some crossings could have flashing lights and a klaxon, as well as the horn sounded by the train driver. "We know there are a number of locations where there are problems but equally there are locations where they don't cause problems," she said. "The question is whether issues can be resolved locally or if technology enables changes to be made right across the network. The industry is looking at that at the moment."